Stephen Decatur sophomore Wil Barrett is guarded by two Easton players during Wednesday’s game in Berlin. Barrett had one goal in Decatur’s 6-5 overtime win. Stephen Decatur sophomore Kellen Conboy takes the ball up the field during Wednesday’s game against Easton. 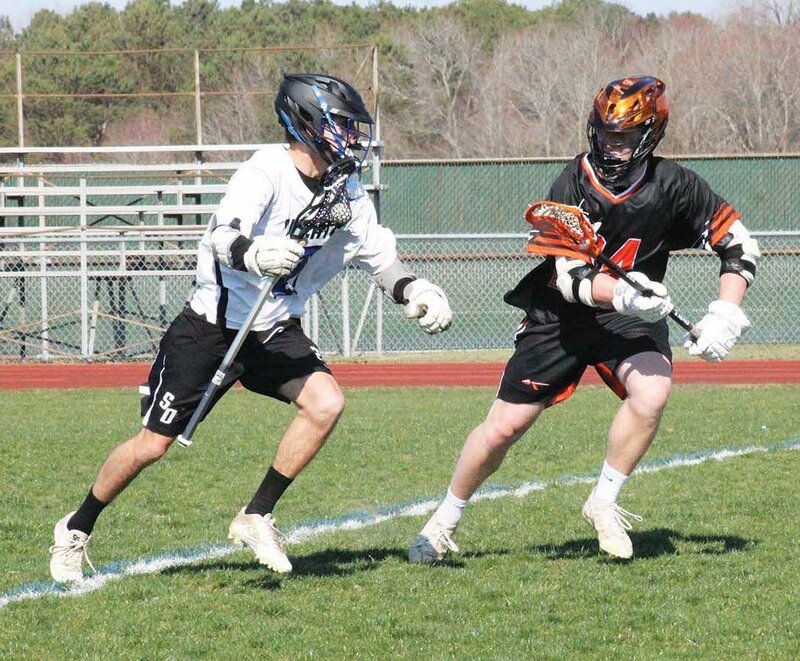 (April 5, 2019) The Stephen Decatur boys’ lacrosse team battled from behind to win 6-5 in overtime over the Easton Warriors on Wednesday in Berlin. Easton led 3-0 at the end of the first quarter. Decatur senior captain Xan Johnston, off a pass from junior captain Eric Gwin, cut the lead to two with 6:13 remaining in the second quarter. The Warriors scored one more before halftime to go into the break ahead by 4-1. Hoffman said the team made some minor adjustments for the second half. “The guys were fired up. We had a good halftime talk and worked through the issues we were having,” Hoffman said. 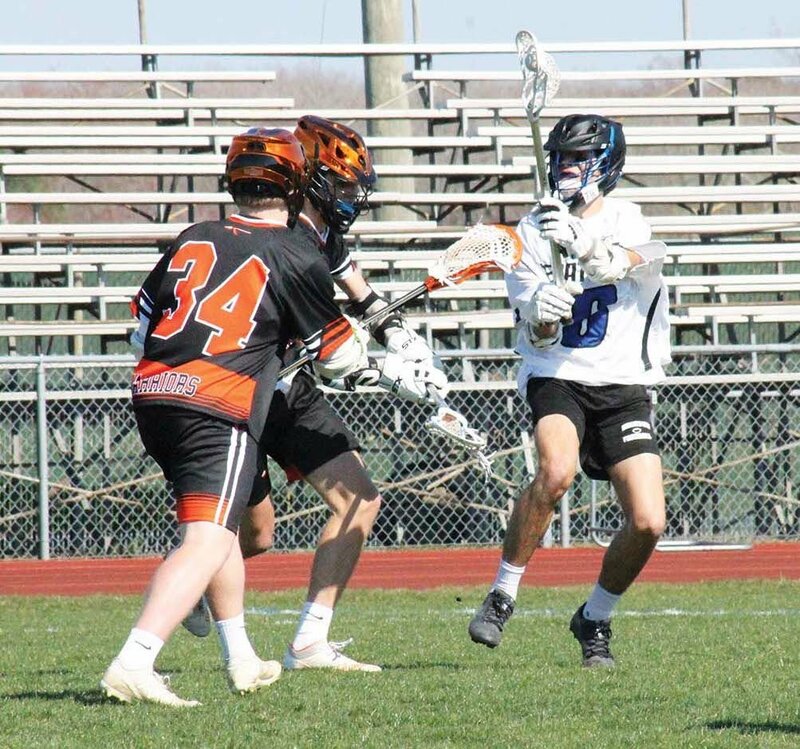 Decatur chipped away at Easton’s advantage in the third quarter with goals by sophomore Wil Barrett, and senior captains Chase Porter and Kevin Beck. After three quarters, the Warriors were on top, 5-4. Freshman Austin Airey tied it up with about six seconds remaining to send the game into overtime. In the huddle before stepping on the field for overtime, Hoffman told the Seahawks they needed to possess the ball more on offense, work it around, and take quality shots. During the extra period, sophomore Riley Rayne forced an Easton turnover and Decatur took the ball down the field. Hoffman called a timeout to settle his players down and calm their nerves, he said. They picked a play to run and the boys immediately executed it on the field. Beck tallied the game winner with 1:27 left in the extra period. Rayne finished the game with 10 ground balls. Junior Tony Scafone made nine saves in the goal for Decatur. He played a great game,” Hoffman said of Scafone. “Defense has been the anchor for us so far this season, and especially the goalie. Offense still needs to improve. It’s a work in progress. Hoffman was pleased with his players’ fighter mentality. Decatur will take a trip to Worton, Maryland, to face the Kent County Trojans today, Friday, at 4 p.m.
A mainly sunny sky. High 69F. Winds SW at 5 to 10 mph.